FRESH, CREATIVE IDEAS FOR THE WAY YOU LIVE, WORK & PLAY IN PARADISE. With over twenty years of experience in both residential and corporate interiors, interior designer Joanne Wells knows how to make your dream a reality. From an early age, Joanne has had a passion for architecture and design. 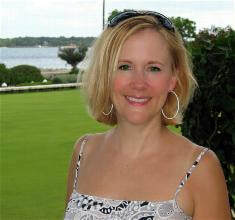 She earned her interior design degree from the Art Institute of Houston and graduated with honors in 1994. She has since been creating beautiful spaces for clients across the country. Whether it is a multimillion dollar health care facility or a small conch cottage, Joanne uses her innate talent and attention to detail to create interiors that are fresh, innovate and casually elegant. Joanne's design philosophy is grounded in the belief that "Great design is a product of the relationship between client and designer." Her enthusiastic and friendly nature along with her extensive knowledge of the industry has instilled confidence in her clients and ultimately, these strong relationships have built rewarding work experiences and beautiful spaces. Joanne is a full time resident of Key Largo and in her spare time she loves to travel, scuba dive and is currently learning how to race a Bullseye sailboat. She also volunteers for the Miami Design Preservation League as an architectural tour guide in the Art Deco District of South Beach. Here are just a few of the furniture and accessory lines we have available. If you see something you like on this website, online, in magazines or while out and about, let us know! We can order it for you and have it delivered and installed in your home. Love, love the new Coastal Living resort collection! Their new Malibu Loft line is gorgeous!! Ralph Lauren Home is now being represented by Kravet! They have a great new fabric line from Trina Turk! The "Flamenco" umbrella is just so fun!